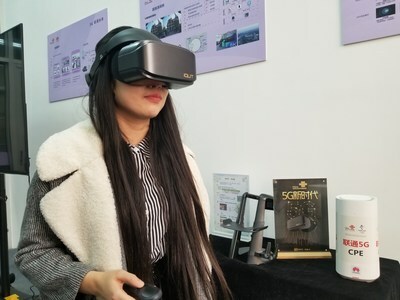 BEIJING, March 19, 2019 /PRNewswire/ -- iQIYI, Inc. (NASDAQ:IQ) ("iQIYI" or the "Company"), an innovative market-leading online entertainment company in China, today announced the launch of its 8K VR visual experience at China Unicom's 5G Innovation Showroom in Beijing, in effort to explore the commercialization of 5G technology. The two companies will collaborate to jointly produce customized VR products in the future. Along with China Unicom's 5G network, the 8K VR visual experience is brought to customers by iQIYI's high-speed streaming "Qisubo" service and QIYU VR Standalone Headset. With the support of 5G technology, users will be able to enjoy an even more immersive VR experience with 8K playback quality at unprecedented fluidity, clarity and resolution. This is made possible by the minimal latency and sufficient bandwidth enabled by the 5G technology, allowing iQIYI's product to successfully integrate Content Delivery Networks (CDN) technology with 5G and Mobile Edge Computing (MEC). "This collaboration marks a successful cross-sector that fully utilizes each company's strengths in the areas of infrastructure and technology," said Liu Wenfeng, Chief Technology Officer at iQIYI. "We are thrilled that iQIYI's cutting-edge technology can be used to explore the endless possibilities in the commercialization of 5G technology and contribute to expanding the boundaries of entertainment technology to enrich user experience." According to Miao Wei, Minister of China's Ministry of Information and Industry Technology (MIIT), China will carry out 5G trials in various cities across the country this year, markin an exciting time to explore the commercialization of 5G technology. In comparison to 4G technology, 5G technology provides Internet at a speed that's 10 to 100 times faster, network latency within the millisecond range, and data density of 10Mbps/Sqm. The implementation of this breakthrough technology in iQIYI's collaboration with China Unicom Beijing has in turn resulted in remarkable progress for the enhancement of VR experiences available on the market. iQIYI's "Qisubo" service can be flexibly applied to various types of networks of all sizes, and customize video content according to the user's physical location. In the future, this service will be applied to VR cinema rooms, offline VR experience stores and other products, so that users in hotels, airports, high-speed trains, universities, shopping malls and other settings can enjoy an extensive selection of high-quality video content. During the 2019 Lunar New Year, iQIYI cooperated with AIS, a well-known Thai telecommunications operator, and China Unicom International Limited (CUG) to make "Qisubo" service available in various hotels in Thailand. China United Network Communications Group Co.,Ltd ("China Unicom") was officially established on 6 January 2009 on the basis of the merger of former China Netcom and former China Unicom. It has branches in 31 provinces (autonomous regions and municipalities) across China and many countries and regions around the world. With a modern communication network characterized by nationwide coverage and global reach, China Unicom mainly operates fixed and mobile communications service, domestic and international communications facilities, satellite IPLC service, data communications service, network access service, value-added telecom services and system integration service related to information and communications services.